Always make sure that the tyres of your vehicle are filled with recommended air pressure. Both low and high pressure will hamper smooth driving and tyre life. Maintain correct tyre pressure to ensure better tyre life. Check and maintain electrolyte level in the battery. Daily maintenance is to be regularly performed especially on coolant level and engine oil level. 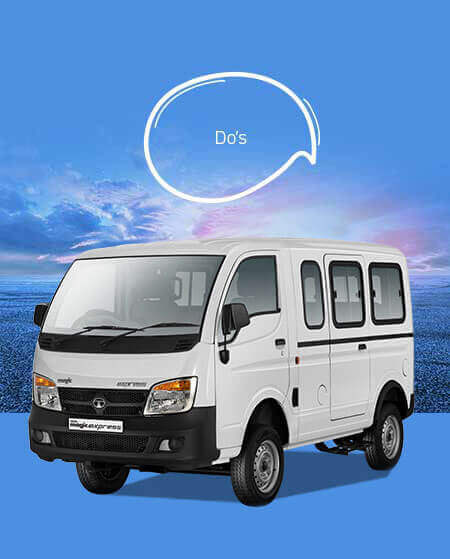 Ensure periodic servicing as per maintenance schedule. For any adjustments or repairs please contact or go to Tata Motors dealership and authorised service stations only. Use only recommended oils and lubricants. Check and replace oil in engine, gear box, rear axles and brake master cylinder periodically as per schedule. 7In case of replacements, use only Tata Motors genuine spare parts. 8Disconnect all alternator terminals while carrying out any welding on the vehicle. Observe correct polarity while connecting alternator to battery. Apply petroleum jelly on battery terminals. Always use recommended antifreeze agents in cooling system to avoid deterioration of engine components due to corrosion. After filling coolant, fit radiator cap firmly to keep cooling system pressurised. Always fit genuine radiator cap for pressurised cooling system. In case of air lock in the fuel system, the bleeding should be done on the high pressure side of the fuel filter, and drain manifold and high pressure lines. Ensure that lift pump operation is satisfactory and proper fuel delivery takes place while bleeding out the air. Always get our genuine and approved parts fitted on your vehicle by our trained mechanics using special tools at our authorised workshops.